Yves Saint Laurent's was only 21 when he succeeded Paris' haute couture master Christian Dior. Saint Laurent was born to a relatively wealthy family in Oran, Algeria on August 1, 1936. A nervous teenager, he spent most of his free time designing dresses for his mother and two sisters. The teenager attended fashion school for only a short time when his mother introduced him to the editor for French Vogue, Michael de Brunhoff. De Brunhoff was impressed with Saint Laurent's sketches and arranged a meeting with Christian Dior. Dior hired him immediately. He was only 17. Gift of Mrs. Hugh J Chisholm, Jr. Under Dior's tutelage, Saint Laurent quickly gained acclaim for his designs. Recognizing his influence on those early designs, Saint Laurent would later recall his time with Dior, "He taught me the basis of my art." When Christian Dior died in 1957, Saint Laurent, at age 21, was named the head of The House of Dior. His first collection marshaled his successful entrance into fashion design history. Shortly after his deferment from service in the French Army, Saint Laurent suffered a complete nervous and physical breakdown. 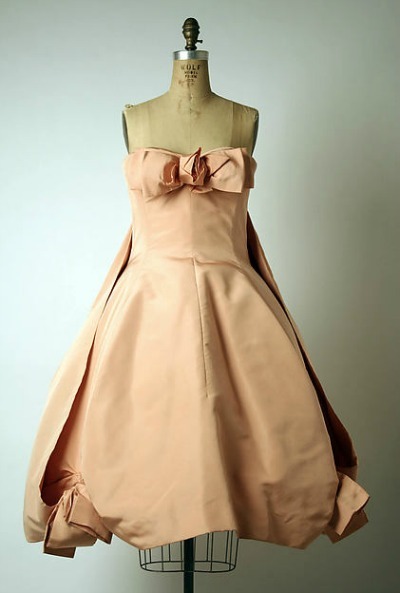 While he was convalescing, Marc Bohan was appointed the head designer for Dior. With a small settlement from the breach of contract suit brought against The House of Dior, Saint Laurent opened his own salon. Life magazine called his debut, "the best collection of suits since Chanel." Yves Saint Laurent was in his element during the 1960's and 1970's. His ready to wear fashions, along with his business partner's acumen, brought the YSL branding to the fashion forefront. Becoming disillusioned with the course of haute couture and stating, "I have nothing in common with this new world of fashion," Yves Saint Laurent's retired in 2002 after 40 years in fashion design.